Are looking for the best personal trainer in Manhattan Beach, CA? You've come to the right place! Personal Training with Certified Personal Trainer and Mr. America, Jason Kozma, is now available on a very limited basis in the South Bay. By overwhelming demand, I’m now providing personal training sessions in Manhattan Beach, CA. In addition to my private training sessions in our Manhattan Beach location, I have a talented and motivated team of top personal trainers in the South Bay ready to help you transform your body and health. Many of my clients are current or former athletes looking to improve performance, to regain or maintain their optimal physiques. With athletes ranging from football to baseball to triathlons to softball and fitness competitors there’s no one workout that works for everyone. Every workout is specifically tailored to each client’s specific needs. The same goes for you. Were you someone who excelled in high school or college athletics? Were you someone who started working out or having an active interest in sports and fitness in your 20’s? Are you looking to regain that active, fit lifestyle and the health and wellbeing that goes along with it? Are you looking to finally get rid of your love handles or extra pregnancy weight? Maybe you’re looking to get back into shape after taking time off from working out. Life happens. Work, family, children, obligations of all kinds always seem to supersede the rest of our daily activities like working out and taking care of ourselves. It’s easy to put everyone else’s priorities ahead of your own. My trainers and I are committed to one thing: your success. Your health and fitness are our priority. Don’t just take my word for it, take a look at our gallery of “Before and After” accomplishments. Each client has his, or her, personal story and reasons to make a commitment to self-improvement. When you’re ready to take the next step in your personal journey, contact me to get started. Jason Kozma is a Certified Personal Trainer and Certified Nutritionist with over 20 years of experience and hundreds of satisfied clients. He has a black belt in Karate and is a former champion bodybuilder with victories at: Mr. America, Mr. Muscle Beach, NPC Southern States Bodybuilding Championships, NPC Tennessee Valley Bodybuilding Championships, NPC Kentucky Derby Bodybuilding Championships and more. 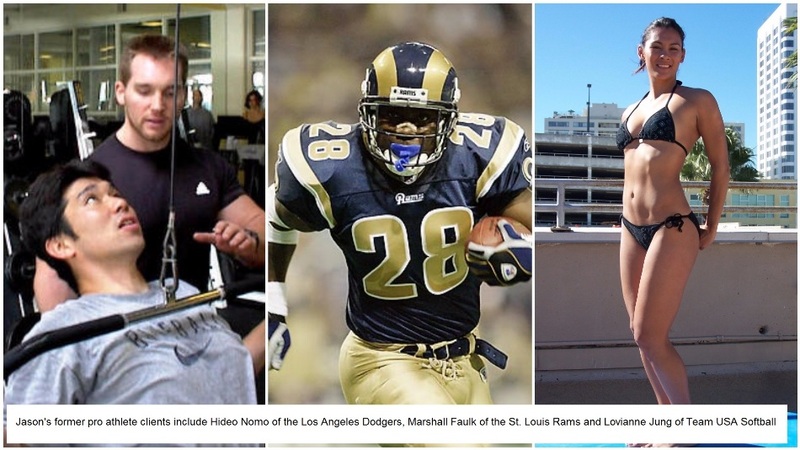 Jason has trained amateur, collegiate and professional athletes, Hollywood celebrities, actors, models and personalities, CEOs and people just like you! Former athlete? It was easy back then finding time to exercise and stay in shape, wasn't it? Exercise and training was scheduled into your day. You also had a coach to motivate you; to help you improve as an athlete; to cheer you on. Fast forward to today. You no longer have a coach. Exercise is no longer scheduled into your day. You've gone to gym off and on, but you find that it's hard, if not impossible to get back to your old level of conditioning, things hurt that didn't before, and you don't really know the right way to start from where you are now. You've considered joining a class (but they are lame and you don't get personal attention) and you have little desire to work out without a good plan. Staying in shape was much easier when someone helped you. Jason Kozma can help you get back to exercising and back to your "fighting shape". He can help you get back to feeling better and keep you motivated. It seems like every week there is new information available about the most nutritious foods or the very best way to lose weight. Navigating the field to find the best nutrition advice for fast and permanent weight loss can be very challenging, so it helps to have a professional like Jason Kozma available to you! Read the 8 weight loss nutrition tips below and then contact him to set up a personalized exercise and nutrition plan that will help you meet your goals. 1) Slow down. It can take 20 minutes for your brain to register feeling full, so eating too quickly often means eating too much. Slow down, savor the food you are eating, and you may find that you eat less in the process. 2) Use a smaller plate. Playing mind games works! Using a smaller plate helps you eat appropriate portions of food, and also makes you think you are eating as much or more than if the same amount was on a bigger plate. 3) Eat breakfast. A breakfast with plenty of protein and fiber will keep you satisfied all morning and help you follow your nutrition plan for the rest of the day. 4) Enjoy an occasional treat. Savoring small treats -- an ounce of dark chocolate, for example -- will help you avoid the danger of overindulging in off-limit foods. 5) Turn off the TV. When you are eating, don't engage in other activities like TV watching or reading. Focusing on your meal will help you stop when you are full, instead of mindlessly eating more calories than you intend to. 6) Eat water-filled foods. These foods help you feel full, and usually offer vitamins and minerals to boot: watermelon, cucumbers, soups, and salads (go easy on the dressing!). 7) Go nuts. Nuts like pistachios and almonds can help drive weight loss, so feel free to add a small amount to your daily snack or meal. Be aware of the high calorie content of nuts, and use them as a garnish or small snack. 8) Boost your fiber intake. Fruits, vegetables, legumes, and whole grains should comprise a large portion of your daily food intake, and they boast high fiber content that will keep you feeling full. Jason will get you started on a personal training program with exercise and nutrition to help you lose weight and meet your goals. He is a certified sports nutritionist and personal trainer. He has the expertise to help you fuel your health and fitness endeavors. Contact us today to get started! More before and after photos - and these are still just a small sample! As you could guess, Jason offers training and coaching for figure, physique, bodybuilding and bikini competitors. Here are a few past clients. All winners have a coach - what better coach for your first show than Mr. America? As an accomplished athlete and bodybuilder, I've worked hard to train others to achieve and maintain their ideal physique as amateur or professional competitors. If you're looking to take your body to the next level and compete in fitness, bodybuilding or figure contests, look no further. I've trained and coached many clients to great success, and I'm here to help you do the same. Believe me when I say there's no magic bullet, pill or treatment that will transform your body into the best version of yourself. The only way is through commitment to an exercise and nutrition program that’s customized to your specific needs. That’s where my team and I come in. When you’re ready to achieve the body you’ve always wanted, or regain it from your earlier years, we work with you to create the perfect workout and nutritional plan to meet your goals and stand on the winner’s podium. 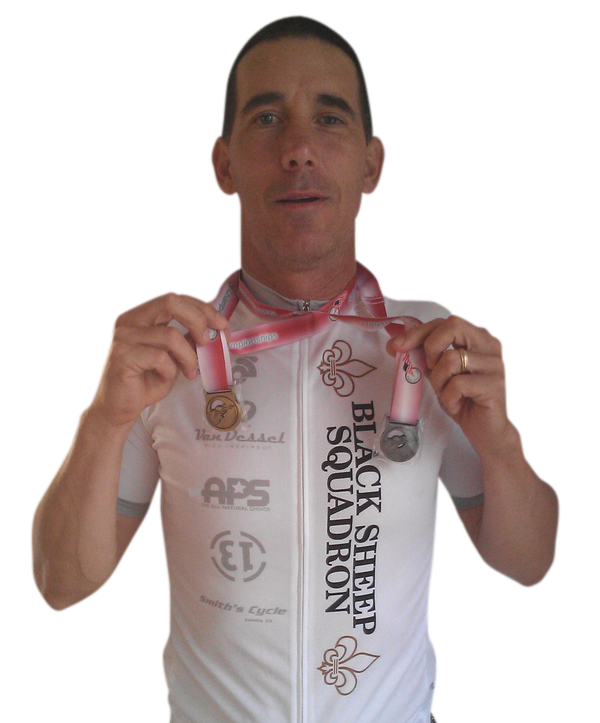 Sean is a competitive cyclist, sports specific trainer and body transformation specialist like Jason. 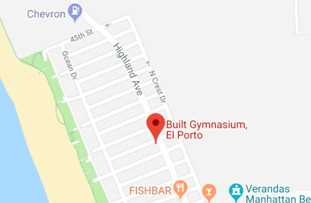 Sean trains his clients in nearby El Segundo, CA. For Sean, training is not just a matter of showing up at the gym and doing a series of exercises. Personal commitment to being healthy and strong is the most important thing. But Sean stresses that you have to be realistic in your goals, progression, rest and recovery, not to mention sticking to your program, nutrition and working hard. “Mind and body connection is paramount,” says Sean and explains that learning what works for you and what doesn’t is a bog part of training. “Log your journal, maintain a healthy diet, change your program when needed and take good care of yourself,” says Sean. Personal fitness goals are different for everyone and working out effectively, without injuries takes devotion and dedication. Sean specializes in sport specific training, weight loss and weight management, reshaping the body, and rehabilitating from injuries. He takes pride and care for his clients and is known to help them achieve their goals. Deena specializes in women's fitness, post partum weight loss and senior fitness. Deena has nearly 20 years experience as a professional fitness trainer. She is certified by AFTA in personal training, yoga, Pilates and senior fitness. Deena is available for in home personal training in Manhattan Beach, Redondo Beach, Hermosa Beach, Palos Verdes and the Southbay area. Deena provides gym based personal training in Manhattan Beach. Update - Deena now offers in home personal training in Santa Monica and Brentwood too! 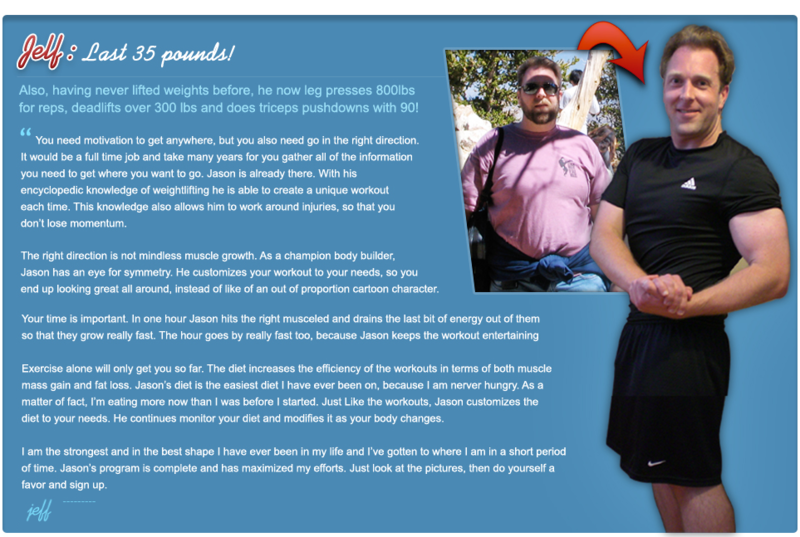 check out Jason's Los Angeles Personal Trainer site here for more client testimonials and before and after photos!